My apologies Web Wandering Wednesday did not automatically post yesterday and I failed to notice. I've received several photographs from readers of individuals with obvious medical conditions or dental problems. I'm busy tracking down the clues in those images—the evidence in those photos may be pertinent to the owners' own health history. In collecting photographs of "women wearing glasses" and in working on the book, I have attempted to fill in the blanks concerning my subject. One of those blanks was photographs depicting medical conditions associated with women wearing glasses. In doing photographic research I have bumped into "before and after medical" photographs, some of which have been identified as having been taken by physicians treating those pictured. 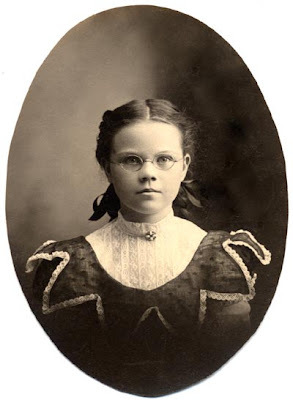 Recently, I was very fortunate to find several photographs of a young girl named Alice Toner who had a medical condition associated with her eyes and, according to the photographs, spent the rest of her life wearing glasses. I have several photographs of Alice. While my research into Alice's life is preliminary, her photographs are pertinent to this discussion. I will show you the photographs and tell you what I know about this young woman thus far. 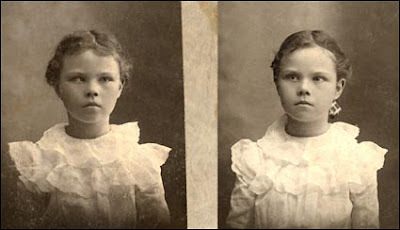 The "before and after" photographs were taken by Miller's Art Studio in Pittsburg, Kansas. There are several Millers who are photographers in the 1880 census. I have not determined which is the correct Miller. Strabismus is probably the condition that defines Alice Toner's optical medical problem. "Strabismus, more commonly known as cross-eyed or wall-eyed, is a vision condition in which a person can not align both eyes simultaneously under normal conditions. One or both of the eyes may turn in, out, up or down. An eye turn may be constant (when the eye turns all of the time) or intermittent (turning only some of the time, such as, under stressful conditions or when ill). Whether constant or intermittent, strabismus always requires appropriate evaluation and treatment. Children do not outgrow strabismus." The condition was identified and treated as early as 1850. The sources for the information on Alice Toner have not been listed as they are preliminary. Alice Toner (Before & After). Photograph (Card Mounted). Unknown. Privately held by the footnoteMaven, [ADDRESS FOR PRIVATE USE,] Preston, Washington. 2007. Alice Toner. Photograph (Unmounted). Unknown. Privately held by the footnoteMaven, [ADDRESS FOR PRIVATE USE,] Preston, Washington. 2007. 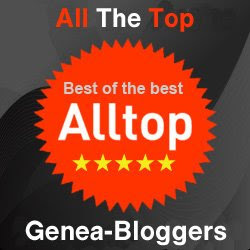 I will be checking out the post on Photo Detective - this is such a wonderful idea! Alice looks beautiful in those glasses and it is fascinating to see her before and after. Wish I had a photograph of my gg grandmother (who wore tinted glasses as a young adult) as a child, to see if she wore them then. As I've mentioned before, photographs of children wearing glass for this time period are very difficult to find. But to find the "Before and After" medical photos, I would have thought it impossible! Keep looking Laura, they may be out there. I've worn glasses since age 12. I see these beautiful old photos of gals wearing glasses that look very similar to today's styles - in other words, small and somewhat attractive. So, why is it that half of my face was covered up during the 1980's (and part of the 70's and most of the 90's) with HUGE glasses? I can't believe now how big they were...you really can't "see" my face! I wish the small trend stayed around longer so folks could have seen what I actually looked like as a teenager!